When the NHL announced the rosters for the 2015 All-Star game in Columbus, the fan selections lacked the traditional star power and spectacle that generally surround hockey's all-star contest. 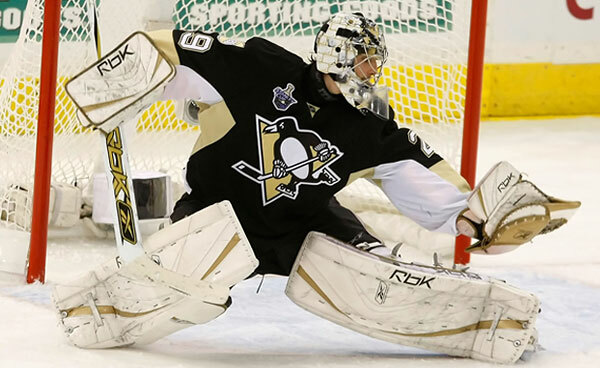 An All-Star game wouldn't be an All-Star game if there weren't a number of egregious snubs and omissions, and the omissions start in net, with Pittsburgh goaltender Marc-Andre Fleury (22-7-4, 2.16 GAA, .926 save percentage, 6 shutouts) hilariously skipped over by fans and league brass for the likes of the terribad Sergei Bobrovsky (15-12-2, 2.88 GAA, .914 save percentage, 1 shutout). The fan-driven voting also had the predictable effect of one team (the Chicago Blackhawks) having five players named as starters, and in a twist harkening back to the days of Sanjaya Malakar (of American Idol fame), the Latvian people faithfully stuffed the ballots for one Zemgus Girgensons, whose true game dominance lies with Words with Friends and not ice hockey. 1) Each player selected will be done as though the player is in the prime of his career (and not in the twilight, as was the case with a few players on this list). 2) Lines are formed with the traditional mindset of Scoring 1, Scoring 2, and Checking, with the Fourth Line an homage to the nature of the All-Star Game. And don't worry: as in true All-Star tradition, there will be some serious omissions that all of you should take me to task on. Discussion: This line has it all: the ultimate grinder (Crosby), the ultimate board specialist (Jagr), and the ultimate sniper (Lemieux). Whoever has the puck entering the zone can count on Crosby initiating a center drive, leaving the other wing available in the slot to collect an easy scoring chance. 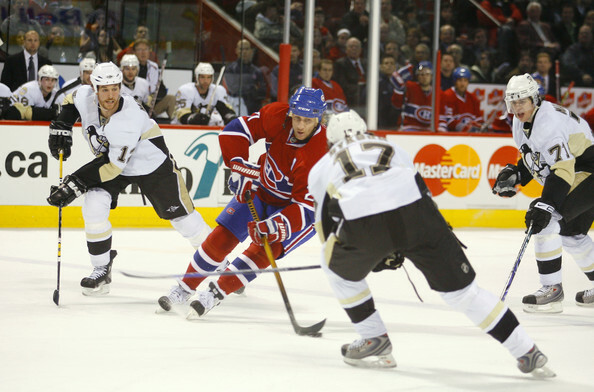 To borrow from Lemieux's comeback game, this line is "Simply the Best." Note: Lemieux played on the wing for a good portion of his career to take advantage of both the excellent centermen the Penguins possessed and to align himself to unleash his otherworldly shot from the left circle. 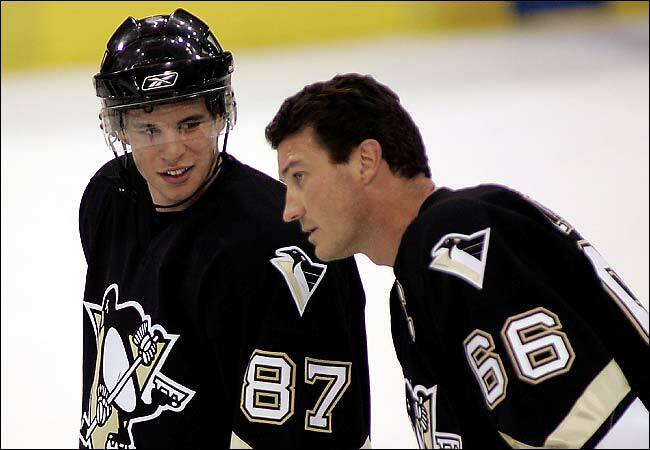 Crosby is also a superior faceoff man compared to the Penguins' owner. 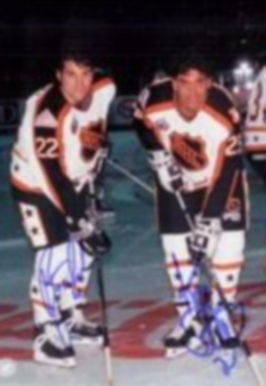 Discussion: While the second line lacks the 'pop' and 'sizzle' of Lemieux and company, Robitaille and Bathgate are the perfect triggermen for the puck-distributing Ron Francis. Robitaille owns the NHL record for the most points in a season by a left wing, and started his NHL career with 8 consecutive 40+ goal campaigns, topping out at 63 tallies in 1992-1993. Of course, Robitaille also starred in "Sudden Death," which makes his inclusion natural. Bathgate once scored 40 goals during the days of the 70 game NHL season (no easy feat), and was an outstanding player for some very mediocre New York Rangers teams: Bathgate didn't just hear "Nine-teen-for-ty! (CLAP-CLAP, CLAP-CLAP-CLAP), the man lived it. 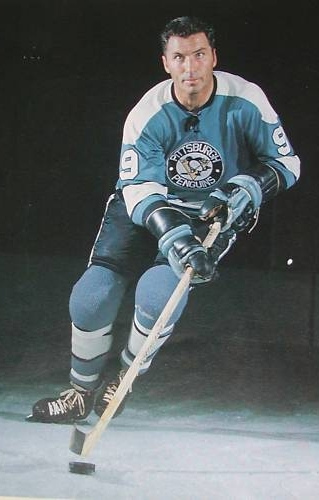 He was selected by the Penguins in their 1967 expansion draft, and dressed for Pittsburgh in their inaugural NHL season. Discussion: My goodness, what a checking line: each member of this line can hit, each member of this line can finish, and each member of this line can grind. This All-Time All-Star line presents the rare case where three players have the full ability to shut down an opposing team's top line while simultaneously presenting a real threat to score each time they're out on the ice. Trottier's skill-set had diminished by the time he joined the Penguins in 1990-91, but in his New York Islanders prime, he was a two-way force capable of scoring 40 goals (a feat he accomplished five times) while playing tough (and dirty) in his own end. Like Stevens, Rick Tocchet was the perfect fit on Mario Lemieux's wing and enjoyed a career year during the 1992-93 season. While playing alongside the Penguins' Hall of Fame center, Tocchet amassed 48 goals and 61 assists for a career high 109 points while adding a hefty 252 penalty minutes. Discussion: With apologies to the traditional 4th line grinders like Joey Mullen, Mark Recchi, John LeClair, Michel Briere, and Rick Kehoe, this roster IS for an all-star game, and the trio of Naslund / Malkin / Kovalev is guaranteed to put on a puck-possession show. It's almost inconceivable to think that the Penguins had Naslund and traded him for the likes of Alexander Stojanov, but such is the reality. Stojanov would go on to be...well, Alexander Stojanov, while Naslund would capture the Ted Lindsay Trophy and nearly the Hart Trophy for the Vancouver Canucks while topping 35 goals five times. Both Malkin and Kovalev have the ability to play puppet master with the puck and have generated their own YouTube-worthy collection of highlight-reel goals. Kovalev routinely receives mention from his peers as being one of the greatest stick-handlers in the history of the NHL, and Malkin's two end-to-end goals against the Tampa Bay Lightning are among the best in league history. In addition to the players named above (Mullen, Recchi, LeClair, etc. 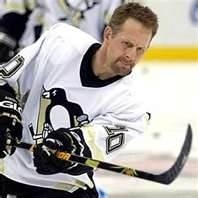 ), Pens Initiative would like to extend a hearty apology to Mr. Gary Roberts. Mr. Roberts, we apologize for your glaring omission, and in no way does Pens Initiative endorse the list that Mr. Traeger compiled above. Please do not hurt us. Mullen is actually one of my favorite all-time players. I was so annoyed to find out that he was only available on the original EA Sports NHL Hockey as a member of the Penguins 2nd PP unit, and so I would run those 5 guys into the ice just so I could try to get Mullen to score.